Terrence Mahon was an 8-time All American at Villanova, where he won Big East and IC4A individual titles. After graduating in 1993, Mahon was a national class competitor who won a USATF national title at 20 kilometers and qualified for the US olympic trials five times combined on the track and at the marathon distance. He owns PRs of 4:05.9 (mile), 8:05.9 (3000 meters), 13:33.2 (5000 meters), 28:31.1 (10,000 meters), 1:03:37 (half marathon) and 2:13:02 (marathon). Despite such an illustrious running resume, he is best known these days as one of the top professional coaches in the country. His stable of runners includes his wife Jen Rhines (winner of multiple national championships while at Villanova and a three-time olympian, at 5000, 10,000 and marathon), the American record holder for the marathon and olympic bronze medalist Deena Kastor (nee Drossin), New York marathon winner and olympic silver medalist Meb Keflezighi, and the American record holder for the half marathon (59:43) and 20 kilometers Ryan Hall. His younger charges include Sara Hall, Ian Dobson, Ann Willard, and Scott Bauhs. 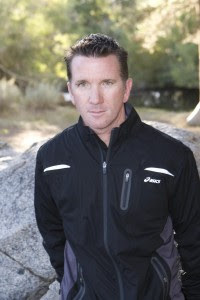 Mahon is head coach at Mammoth Track Club in California, which has developed into a mecca of elite distance training. 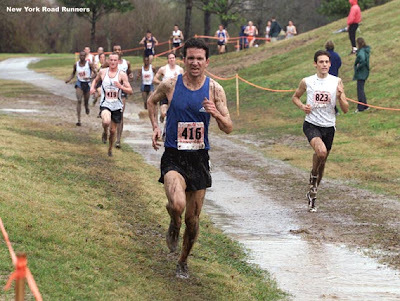 Mahon is shown above at the muddy 2003 USATF cross country nationals, where he was a top 20 finisher.